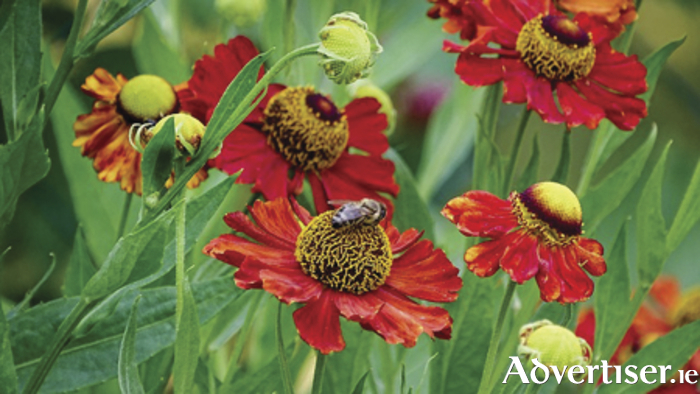 Open flowers such as these heleniums are ideal for attracting beneficial insects. Early this morning, letting the dog out to, ahem, powder her nose in the garden, a gentle humming reminded me that the day’s work was already under way for bees on the early shift. Closer inspection of a nearby catmint revealed several little furry bodies buzzing harmoniously as they moved methodically from one bloom to the next. This plant – Nepeta “Six Hills Giant” – is a magnet for them and you will often find several bees busy at work on the same plant. Did you know that bees and other pollinating insects are considered to be in decline? This is very bad news for larger species such as ourselves as we depend on them to pollinate the plants we need for our own food supplies. Most of us are weary of hearing about the latest threat to the planet, but this is one a lot of people aren’t aware of. If you are lucky enough to have a garden you might like to know that a few simple things can make all the difference to saving these little creatures who right now need us as much as we need them. If you’ve ever set out to buy an apple tree you’ll know how important pollination is, and you’ll probably find you needed two trees of different varieties for pollination and fruit. But apart from pollination there are lots of other benefits to encouraging beneficial insects into the garden – the larvae of hoverflies for instance, who hover over plants just like tiny helicopters, devour aphids like nobody’s business, which makes them particularly welcome in my garden. Unfortunately the increased use of pesticides along with other factors is having a damaging effect on the pollinating population. So what can we do to make life easier for beneficial bugs like these? By extending the flowering season and including pollen and nectar rich plants, you can provide a valuable food source which is vital to their survival. For instance crocuses, which are in flower as early as February will help, as will many winter flowering plants. Another thing to look out for is plants with single flowers, by which I mean a single row of petals such as daisy – like flowers – double or multi-petalled varieties, which have become increasingly popular as they’re more showy, often don’t have any pollen, or the bees can’t reach it. Also, if you need to use pesticide, please try to avoid doing so while plants are in flower. Next week I’ll show you some great summer plants to get your garden humming!